One of the things that make me really giddy is when I spy someone using my stamps by Stampendous or also my stencils with StencilGirl Products So I thought once in a while I would feature the work of those wonderful talented people with a series called: designed by n*Studio features:…..
Janelle is part of the Design Team since 2011 and I spied this wonderful notebook she created, using my Fiesta Stamp Set for the flower . Love how she stamped the flower on painted canvas and then cut it out and layered it for a dimensional book mark – so clever and beautiful! Check out her blog post including a tutorial on how to create the notebook on her blog here. Lea is part of the Stampendous DT since 2012 and I found this fun Garden Canvas she created using my Fiesta, Kaffee Klatsch, Mish Mash, Wired and Grunge Stampset. I love how Lea used all the different stamps and created this whimsical garden – I also love the texture and the happy colors. Here is what she used and how she did it. Wendy is part of the Design Team since 2009. I love her darling scrapbooking layout using my Kaffee Klatsch Stamp Set on an acrylic sheet. I love how the stamps look really lacy on the sheet- beautiful. You can see what she used and how she did it, here. Pam is part of the Design Team since 2002 – WOW! 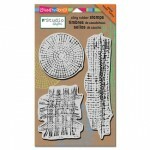 Given my obsessions with houses and cityscapes – I was delighted to spy this piece by Pam using my Mark Maker Stampset. I love how she used some of the stamps in the set to mimic roads and how she used some others with embossing powder for the background. You can read what she used and how she created these happy houses here. I love how all four of them incorporated the stamps in their own styles and so differently. Thank you to the Stampendous Design Team for using them and doing such wonderful work- you girls rock! Thanks for the mention, Nat! I love using your stamp sets on layouts! They make the perfect background! Thank you, Nat, for sharing my art on your blog today! It’s such a thrill to see it here. By the way, I named my flower garden, “Nathalie’s Garden.” Don’t know if you saw that on my post or not but, I thought it was only fitting to name it after you! Thanks again, my friend! Oh thank you Nathalie for the mention. I so enjoyed creating that notebook with the Fiesta Stamp Set! Have You Seen Anything Exciting at CHA? or … What about Surfaces/Substrates? I just came back from six days at the CHA Show in Anaheim, California. CHA is the Craft and Hobby Association and holds a big Trade Show for the latest and greatest regarding Craft and Hobby every January. The most asked question between Designers, Artists, Crafters and Educators this year was “Have you seen anything exciting at CHA where you think I should head right over to?” This wasn’t an easy question to answer. My friend Seth Apter did a great job listing the Trends to Watch and some thoughts on his blog – and I agree with everything fully . I personally was on the hunt for Surfaces/Substrates at CHA whenever I had a bit time between meetings, and demoing (I will post some photos of that later ;) ). As most of you know I am working with my dream paint company right now and I am always on the look out for some wonderful surfaces that I can incorporate in my artwork or in my Mixed Media Workshops. Mixed Media is still a hot and climbing trend in the Craft and Hobby Sector and it was EVERYWHERE but it was really hard to find something that made me excited to work on regarding as a surface. Most paper crafting manufacturers seem to venture into producing paints and media that already exist. I was a bit surprised by that. Wouldn’t it would be so much more innovative and successful to come up with something unique that works with the products a paper craft company already manufactures but also supports other media? Oh well…. These resins excited me! They were unique and not main stream- they can be used in Mixed Media – Assemblages, Canvases but also for Scrapbooking and Card Project. For me a great idea and I love the unique designs ! Nice and sturdy cardboard albums, in different color schemes, with nice and thick paper inserts – different designs as with pockets and tabs. Graphic45 came out with some great paper lines and embellishments to go with those books to make them into calendars or recipe books- but they also can be altered and used with paints – I cannot wait to play with one and make an Mixed Media-photo-album out of one of those. I know… Boxes – but- I liked those- nice quality boxes – with so many possibilities. Alter them with Scrapbooking Paper, make recipe boxes, make shadowboxes, home decor items- with photos – use them for a Mixed Media project …you see – endless possibilities and a good fit with their already existing paper products! Cosmo Cricket did it for me this year in coming up with great surface ideas for the craft and hobby industry!! I love their Watercolor paper, cards, tags and blocks printed with gold and clear foil resist. You can not only add watercolor, but also acrylic inks and make some easy yet artsy looking cards etc. I think this is a great gateway into experimenting with Mixed Media for people that want to get a tiny bit messy but are still clean paper crafters ! This one was my favorite! These are canvases with a wooden back. You can use them either kind of like a shadowbox or paint on the wooden surface- which is fun too – as you will have a frame then already. BUT even cooler, if you want to wrap it in fabric, they added super strong adhesive on the edges and every block comes with thumb tacks for reinforcing the corners. this means you can add any painted fabric – duck canvas, stained and painted canvas or fabric on top of it- in an easy peasy way. GREAT idea!!! If you were at CHA- let me know your thoughts- and if you weren’t let me know your thoughts about surfaces or substrates you personally would love to see ! Thank you so much for including my RELICS & ARTIFACTS resin craft blanks by Sandra Evertson/Prima Marketing Inc. in your top five picks for CHA 2015!! I’d like to invite you to the Prima Marketing Inc booth this Winter 2016 CHA, we are going to introduce an even more fabulous companion line to mix and match!! Thanks again! And hope to see you there! Hey Nat. Great seeing you at the show. Thanks so much for including my link in the post. And for sharing these product favorites. Somehow I missed a few of them at the show. It was so nice to see you and Suze in front of the Prima Finnabair demo. Missed you at Art Venture this year. Itch wood back. Also would like to see uses with all the wood embellishments I saw here and in retail and some ideas. I am very interested in the mixed media albums. I tend to love Graphic 45 products. Resin relics…yeah. I wasn’t at CHA, but watched quite a bit of the action on YouTube. I about pooped my pants when I saw Sandra Evertson’s new line with Prima because I am already a big fan of her stamp line. However, I had no clue about that Cosmo Cricket line, so the gallery blocks are going right to my wish list. I’m looking forward to your new stamp release as well! And I totally agree with you about the paper companies invading the paint territory, they just need to get off that bandwagon already. Thanks for sharing this info!! Love all your choices. The Prima Relics are too cool. Need to play with them for sure! I appreciate your overview you’re the expert! I do however ADORE that luggage that Jen painted on CJS!!! And I have a huge supply of vintage ones- just asking for paint!! I think you need to design a cool substrate Nat!! hint hint! Very thrilled to be the guest poster on Simon Says Stamp Blog today. They do carry all my signature n*Studio Stamps designed for Stampendous! Check out how I made the cards and what I used on their blog. Your cards are fantastic!! A pleasant surprise to see the card version of your MM talent! Left some love on the SSS blog for you!! I love that your stamps are so versatile Nat. Yay! Nat made cards. Very good. Such fun cards, Nat…love those stamps! Congrats on being featured at Simon Says! Nat..these are fabUlous..and you have given me inspriration to make some cards with my favourite stamp sets!! Wonderful cards Nat- very organic and fun! One of the things that make me really giddy is when I spy someone using my new stamps by Stampendous or also my Stencils with Stencil Girl Products :) So I thought once in a while I would feature the work of those wonderful talented people with a new Series called: designed by n*Studio features:…..
Adrienne is part of the Stampendous! Designteam and when I saw her amazing work with my stamps in the catalogue I fell instantly in Love with her colorful yet grungy style. It all just comes naturally and organic together- I love it! And…her kids are so adorable! Thank you Adrienne for sharing your amazing work with my stamps with me! I want this stamps there are so amazing!!! Glad that you featured Adrienne’s art- so very cool~ and yes, her children are adorable! I have my stamp set picked out and on the TO BUY list! I assume – since I never keep track of my colors that I use ;) – that it was Liquitex Cobalt Teal- if that is the one you are pointing too ;) In any event- these are all Liquitex Colors. Cool to feature artists Nathalie. I definately am crazy about your new stamps as I like the raw, organic look…and I’m fascinated with what Adrienne did using them. Adrienne is a true artist! Wow, love the way she blended her photos into her background. The stamping is amazing and all the texture, perfect Layouts! And, my hubby came over to see what I was looking at, and he agreed. And, we stared in awe together and had a great convo about art and style and texture and media. Super inspiring! Thank you!! Adrienne is amazing!!! Those layouts are gorgeous and oh so unique! I had stamped with Gesso on white card stock – let it dray and then added Liquitex Acrylic Inks with a cosmetic sponge and also by dropping it down the top. I also used the stamps embossing with Stampendous Aged Enamel – love the 3-D Effect. I LOVE LOVE LOVE your new line of stamps. They’re so much fun. Being the stamp junkie I am, (no, seriously I need a 12 step program) I cannot wait to add these to my stash. They will certainly be well loved and used frequently. Lovely LO! I love the colouring effekts and the texture. Cannot wait til I get those stamps. That looks wonderful, the texture is fab. Love your new stamps. A really beautiful layout – love that shade of blue and the drippage! Your stamps are truly fabulous and I can’t wait to get my hands on them. I have recently swore off buying any more new stamps but this set might have changed my mind. Very cool LO and it makes me think of snow on a sunny day. The article was about the different uses of the Prima Distress Tool. Congrats for you! You sure are rockin the Art world! Loving everything you are doing and love the inspiration you are sending out! One more thing, I really do appreciate and Love the way you display your products used in a piece- thanks so much! This is a gorgeous canvas and so is the lady in the photo! I love that photo & that is a gorgeous page. Ohhh I am so excited about this new What’s The Point stencil too because it has so many possibilities. For this Scrapbooking layout I used my new What’s The Point Stencil with PanPastels. Beforehand I had also treated the paper with PanPastels, then laid the stencil on top and dabbed the paint through. I love how vibrant the dots become. Oh now this is a cool stencil.. Can’t wait to try it out. Some of the simplest designs are the best one. LOVE your new stencil and what you created with it!!! I love wonky dots! This pattern is perfect! Random scatter and decidedly not round. On my list!!! Nat..this stencil is absolutely a must, no doubt about it , no questions asked ,have stencil…it is brilliant and sooooooooo versatile!! Gotta find a source for these beauties!! Loving this stencil…I can see a multitude of uses! What a fun LO and yes, the story is needed (or it might have to become a Whatevers) LOL…just kidding. That stencil is a simple design with so many possibilities. Oh, yes I too see possibilities in this stencil:patterns for clothes, blurred snowy backgrounds or foregrounds ! I love your colour combo too! Still laughing about this photo which shows the three of us doing a Facetime call when I was teaching in Stockholm. I used some Liquitex Heavy Body Acrylic Paint and swiped it with a Palette Knife over the Circuit Stencil onto a white sheet of Cardstock. I love the texture the Heavy Body Acrylic Paint gives when used with a stencil. I used Tim Holtz Distress Inks with a Blending Tool and colored in the background over the stenciled area and then applied the Papers. I love how you can also use the Circuit Lines as a guideline for the journaling. Really beautiful, love it. Cute cat too. This stencil is so you; so contempoary! I like the journaling idea too. I have never been able to write straight w/o a guide-line. Lol. Congrats on your new stencil collection. 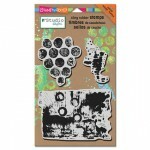 I am so loving stencils ever since I purchased some of Julie’s. Now I can get some designed by you…I’m in Heaven! Love that stencil, & the bingo card, but mostly the pic of your cat! Wohooo – so happy to come back to Sweden this year to teach at the Creative Moments Event organized by Scrap-Perra. In this Workshop with Nathalie Kalbach, you will create a stunning and unique canvas that will be a wonderful home décor item.Learn how to create dimension and texture with tissue paper, items of daily life, acrylic paint, lace, burlap, and gesso. Learn how to reveal the interesting and eye catching texture with acrylic paints and acrylic inks and add some fun stamping techniques on top. In this workshop you learn how to use Acrylic Paints in your Art Journal. This class shows all kinds of possibilities using Acrylic Paints with different media.We will start with the basics then make our way up to more advanced techniques. Everything will be taught in an art journal. I will share with you my favorites, whether it be how to build up interesting backgrounds, resist techniques or incorporating other paint media for stunning layers. I will share with you why I’m doing things, how I got the idea, and what works and what doesn’t seem to work. Join the uber-fun in this class! Class is at least 4 hours. Are you ready to dive into art journaling? Let’s sound a barbaric YAWP over the rooftops of the world and get ready for a lot of creative freedom. I will teach you how to create your own easy to create art journal using wonderful PanPastels.Learn mixing, blending, painting and drawing with those soft pastels. Learn how to get stunning results with different resist techniques and fun stamping tricks using embossing powders and other paint media. You can easily apply all of the learned techniques to later projects whether it be art journals, mixed media and even scrapbooking projects. Looking forward to yawp along with you in this 3 1/2 hour-long class. I am so thrilled to teach with also my sweet friends Birgit Koopsen and Janna Werner and to meet Asa Danielsson. it is going to be lot’s of fun! If you want to know where else I am teaching this year- you can check my in-person Workshop schedule! Hope to meet you!!! I’ll see you there!!! Just waiting for the final dates and time of the workshops so we can book :-) . I’m really looking forward to this event and your workshops!